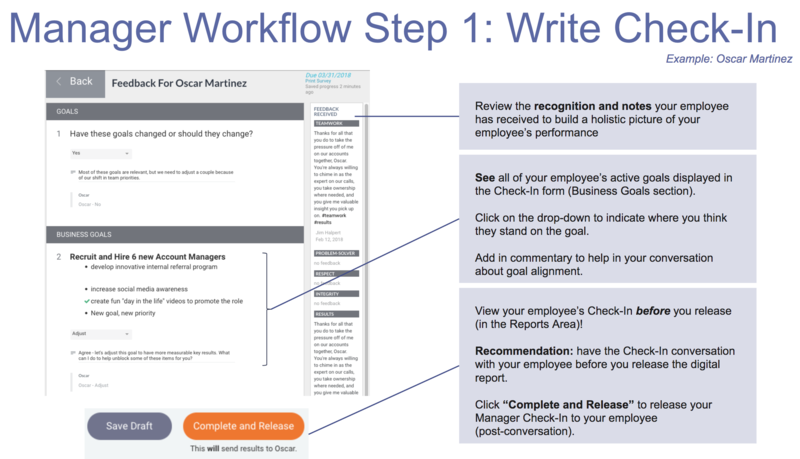 The below will walk you through a typical check-in workflow. If your company is not running a Goals Check-In (where active goals in Reflektive get pulled into the check-in survey form), you will not see your direct report's goals in the survey form. Ideally, you and your direct report had a goal alignment conversation at the beginning of the quarter, and when adjustments to goals happen throughout the quarter, your employee's goals have been kept up-to-date. If goals are up-to-date, please encourage your employee to start writing their self check-in! Remember that only active goals are pulled into the check-in form so be sure that their active goals are up to date in Reflektive! Once your employee submits their Self Check-In (or you submit the Manager Check-In), you will not be able to update the goals that are in the check-in form. After you click on "Check-in," you'll see a survey form with your direct report's active goals incorporated. If you need to edit these goals, please talk to your direct report or do so in the Goals tab. If your company is not running a Goals Check-In, you will see the survey questions immediately. In the survey form, you'll be able to view your employee's self-assessment as you write your manager assessment. Note that the questions in your employee's survey form may be different from the questions in your survey form, so it's recommended that you view their check-in form before you finish writing your manager check-in. Remember to click on "Complete and Release" to complete your manager check-in! Once you click on "Complete and Release," your direct report will receive an email notification. Congrats, you're done with writing your manager check-in! If you need to edit your manager check-in after you submit, please navigate back to the Check-in tab and click on the "Edit" link.